On 'The Tonight Show,' A Relaxed Hillary Clinton, Finally : It's All Politics Clinton has struggled to seem at ease on the campaign trail given the controversy surrounding her use of a private email server as secretary of state. She broke through that Wednesday night. 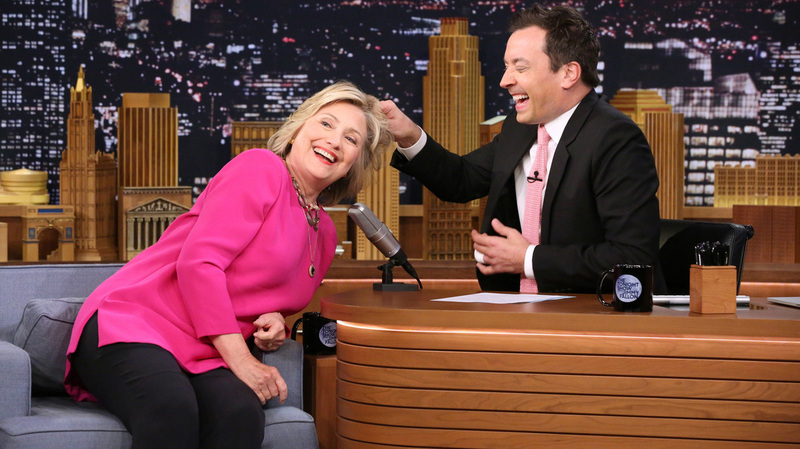 Asking Tonight Show host Jimmy Fallon if he had ever touched Donald Trump's "real hair," (he had not) Clinton offered "you want to touch mine?" It has been difficult for Hillary Clinton to seem relaxed and at ease on the campaign trail, especially as questions about her use of a private email server as secretary of state have dominated. Voters have apparently felt it, as polls have showed she has big hurdles when it comes to people liking and trusting her. She has tried — largely unsuccessfully — to appear relatable, talking about how she's a new grandmother. But, for the first time in this campaign, she may have finally found her stride Wednesday night as a likable grandmother on The Tonight Show with Jimmy Fallon. Her perceived stiffness is something Saturday Night Live dug into early on in her campaign with a parody skit showing her at a beach in a pantsuit, trying to appeal to young voters. Clinton also tried at the beginning of her campaign to counteract her perception problem by doing a small roll out of her campaign launch. She posted videos showing her talking to "regular" people in Iowa and elsewhere. (Though, as NPR's Tamara Keith reported, she was actually talking to hand-picked supporters.) And her campaign recently announced it's spending $2 million in ads to air "getting-to-know-you" ads in Iowa and New Hampshire. People close to Clinton often say she is misunderstood, that behind the scenes, she's actually warm and funny. But it wasn't until her appearance on the Tonight Show Wednesday that that finally seemed to break through in this campaign. "You know, this is a huge election, you never know what might happen, let's get rid of the people who don't agree with us, and only talk to the people who do," Clinton said, mimicking Trump. Clinton was even able to sneak in some policy. She used the light-hearted interview to try to relate to Fallon (and all those watching) as a parent. She urged him to read to his children and explained how babies develop language even when they can't fully understand it. When Fallon mentioned it was his daughter's first day of pre-school, Clinton gasped, "Oh my gosh. How are you doing? How are you even here?" She squeezed in rapid-fire talk about other campaign issues — raising wages, college affordability and immigration, to name a few. It was just one appearance on one (friendly) talk show. That won't solve Clinton's her likability issue. But don't be surprised if she winds up paying Fallon — or other late=night hosts — more visits. Then again, Fallon's campaign advice wasn't exactly spot on. "You sound like a robot," Fallon quipped at one point, impersonating Donald Trump. "You want to win, here's what you gotta do. First, yell."